The Beatles revolutionised pop music; it’s both as simple and as big as that. They wrote some of the world’s most memorable songs, used the recording studio in a way no one had before and broke up when their star was still high in the sky. But they were completely a product of the rock’n’roll era. The roots of the Beatles lie in skiffle (Lennon and McCartney met playing skiffle and formed a group called the Quarrymen), and the rock’n’roll that swept over British shores. Recruiting a young George Harrison, drummer Pete Best, and Lennon’s artist friend Stuart Sutcliffe on bass (McCartney played guitar); they began playing locally around Liverpool. Local promoter Alun Williams managed to get them a gig in Hamburg and at the beginning of the 1960s they plied their trade in the clubs there, most notably the Star. McCartney took over the bass when Sutcliffe left (he stayed in Germany with the girl he’d met), and there was uproar when the group returned home, sacked Best and recruited Ringo Starr. But he was exactly what they needed, changing their sound slightly. By now an experienced band, Lennon and McCartney had begun writing together, and the lunchtime sessions at Liverpool’s Cavern Club packed the place. That drew the attention of Brian Epstein, who ran an appliance and record shop. Captivated by their performance, he offered to manage them. However, even with his backing, it still took a while before a record label was willing to take a chance on the group, and even when they went in to make their first record, Starr was replaced by a session drummer under the direction of producer George Martin. The First single, Love Me Do, scraped the charts, and lay a foundation for what was to come next - the big hits, Please Please Me and From Me To You. With those two, and a debut LP that ruled the album charts, the Beatles were a phenomenon unlike any that had happened before in Britain. By the time they released She Loves You, Beatlemania was rife, the band members were mobbed wherever they went and their concerts full of screaming girls. I Want To Hold Your Hand cemented their stature, but it showed something else – that the writing partnership of Lennon and McCartney was relentlessly fertile and creative, absorbing ideas and forging ahead at a remarkable speed. America fell to their charms, and by the end of 1964 the Beatles were the biggest group in the world with a gruelling touring and recording schedule that took them all over the globe. The quality of their output remained high and endlessly adventurous. They even found time for two films, A Hard Day’s Night and Help!, both of which were as dryly humorous and cool as the band members themselves. Their music was constantly moving on, but perhaps the first signs of a huge change came with Rubber Soul, which bore the influence of Bob Dylan in its generally acoustic approach, followed by Revolver, which saw them exploring the possibilities of the studio and psychedelia. 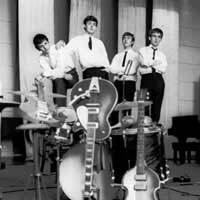 By August 1966, exhausted, they made the decision to stop touring to concentrate on the studio. Unusually for the time, it would be almost a year before they returned with a record, the hugely influential Sgt. Pepper’s Lonely Hearts Club Band and the single Penny Lane/ Strawberry Fields. They upped the ante on music, using the studio in a way it had never been used before, almost as an instrument, with producer Martin’s contribution vital to the sound – a sound that could never be reproduced live. It came at a time of spiritual questing, and the Beatles themselves studied with the Maharishi Mahesh Yogi, a session that ended with news of the death of Epstein (although George Harrison would continue his Indian studies). The dynamic in the group began to change when Lennon took up with avant-garde artist Yoko Ono, and his focus began to shift away from the group. Yet they still made some wonderful music, like The Beatles (known as the White Album). It was more back to basics, a course they pursued during the recording sessions for Let It Be, which were also filmed, and occasioned their last ever performance, on the roof of the Apple building in 1969. The movie showed a band slowly splintering as the members grew in different directions, and it would be shelved for a year. Instead, they made a far more complex studio disc, Abbey Road. It would be the last thing they recorded together (although Let It Be was the last release). By 1970 the Beatles had ceased to exist – the band had really broken up months before – and the members pursued their own paths. Lennon died in1980, after being shot by a fan outside his home in New York and Harrison, despite surviving a knife attack in 1999, succumbed to cancer in 2001. But the legend, the legacy and the music of the Beatles remains a vital influence on music, even decades after their demise.